How were these painted on the originals? Possibly they were done freehand with a brush just as you have done . . . I have no idea but that sounds possible. I'm happy with the result regardless. Matthew - Glad to see a Whippet under construction. They are so odd looking they are cool. 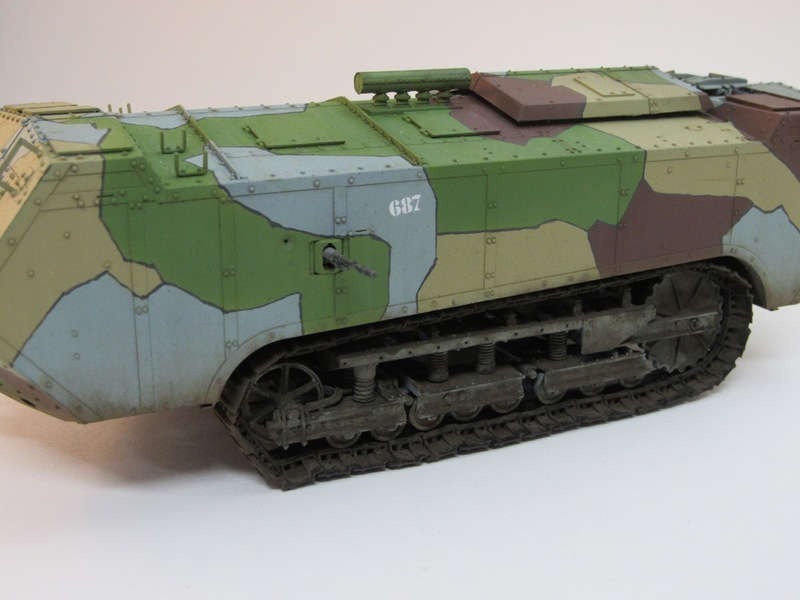 James - What a great job on one of the lesser know tanks of the Great War. Your build is convincing, the undercarriage looks properly used and the bright colors with the separation line will draw many an eye. Great job on your first campaign! Don't forget to post a few pics of your project on the gallery. Is it too late to join in?? Thank you. Those bright colors will also look good on the shelf (it's a sea of green right now). Uploaded a few pictures to the gallery, gotta start collecting ribbons now. @James. Love your Chamond - looks very nice indeed. 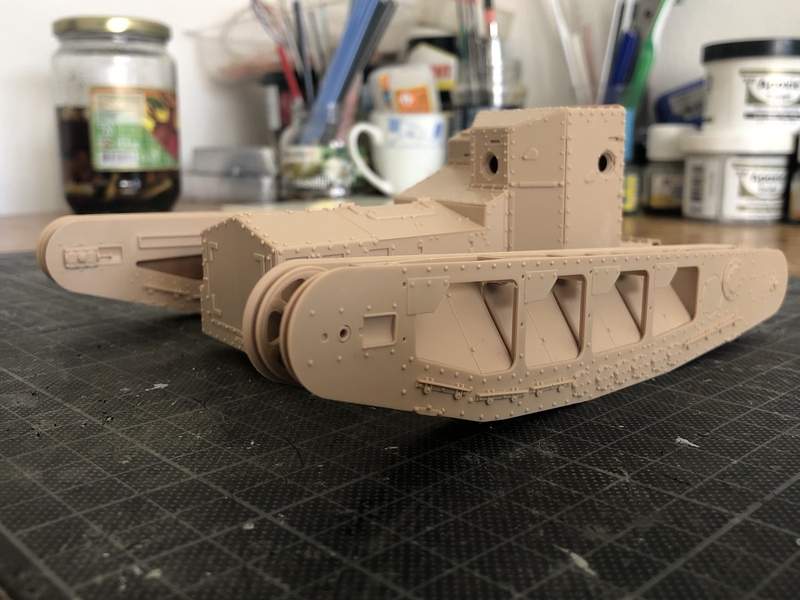 I have quite a bit of progress to report on the Meng Whippet. I didn’t follow the construction steps, but cracked on with the running gear first. Steps 7 -13 are finished. Then I started on the hull. Steps 1-5 also finished, but for a few small detail parts. 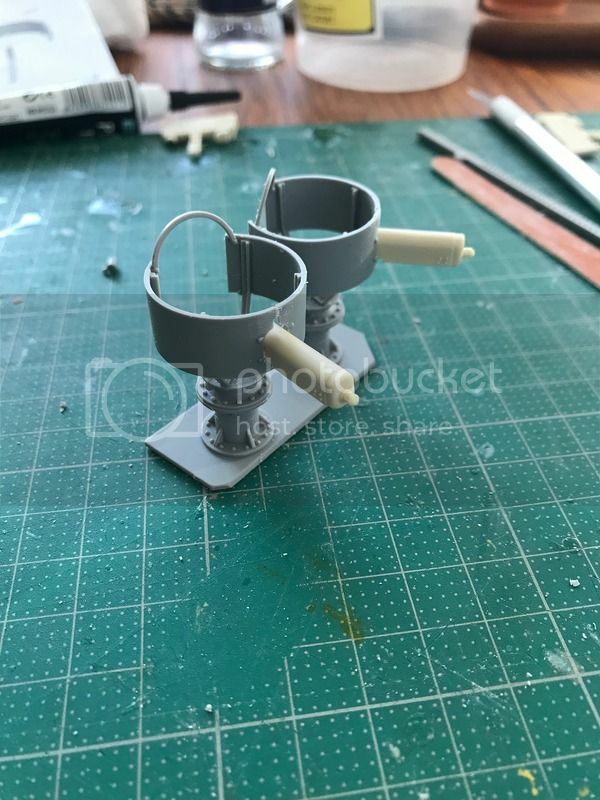 The kit is superbly engineered, and the fit is excellent, but I advise removing all the parts for the turret structure and assembling them in quick succession to ensure the right angles, etc. I will press on with the details, tracks, etc. this evening. No, please feel free to join in. I have yet to start my own project, a Mk. IV tank. Matthew - Your Whippet is coming along quickly. 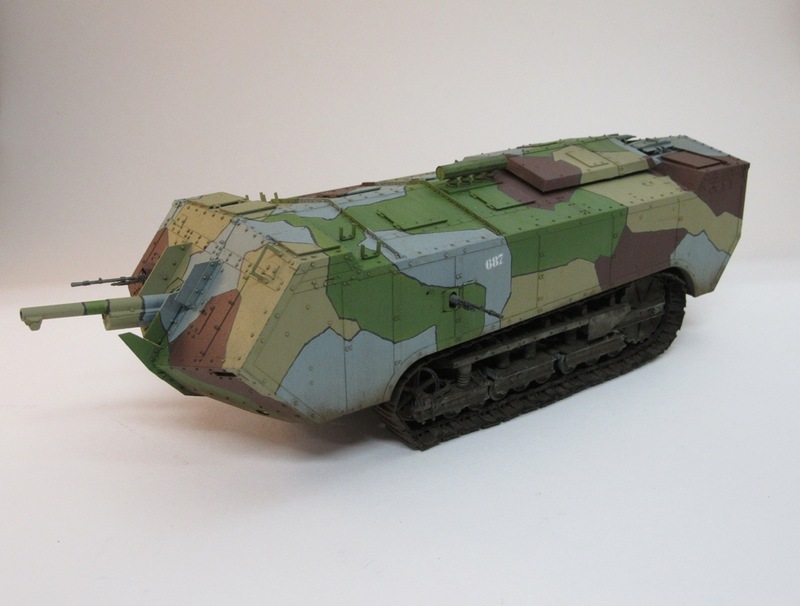 Have you decided on paint & markings yet? Awesome! 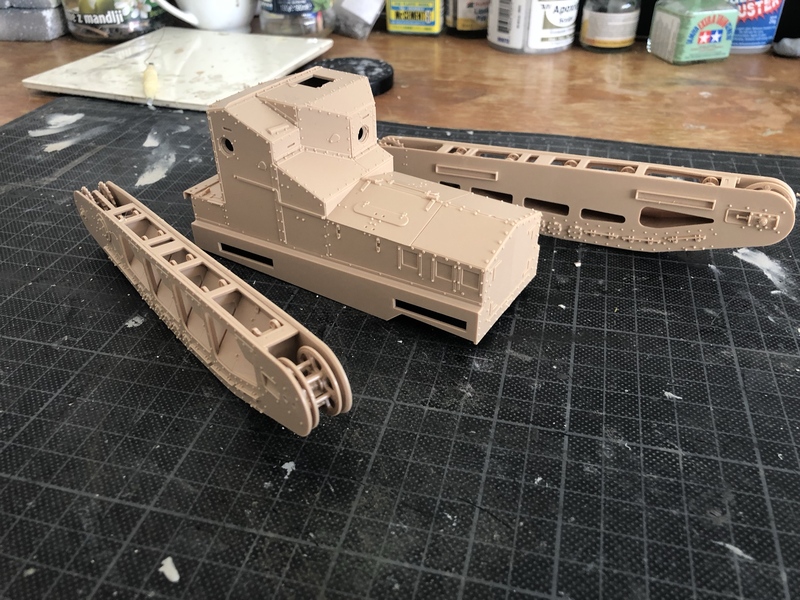 Just started on the Takom Mark 1 female today, will post picutres soon. Thanks Paul. There aren't too many parts in the box and they fall together very easily, hence the quick build. Still not sure what markings it will have. Maybe "Firefly" or "Caesar II". Will post more progress pics soon. 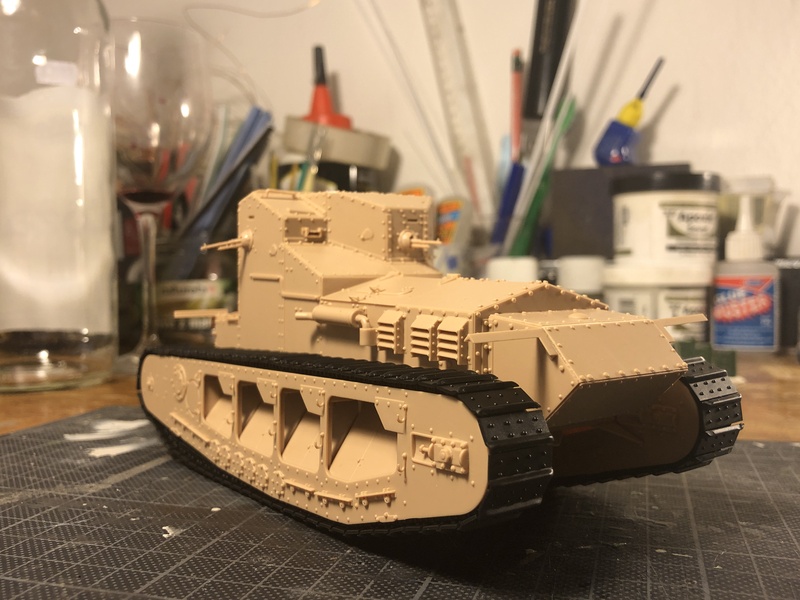 Just started on the Takom Mark 1 yesterday. Its coming together quite well, the only tedious part is assembling all the road wheels. Super glue to make it look like a lence. Gonna continue the boring work of assembling the rest of the small wheels while waiting for the MR Modellbau resin correction set to arrive. We have a product called Elmer's School Glue that is basically a white glue that is perfectly clear. I use it as an adhesive and to make glass lenses and instrument faces. It does shrink a lot and repeated applications are needed to fill any gap. Ah. Gonna see if we have something similar in Sweden. That Whippet is looking great even in its naked plastic. It looks like Takom did a nice job on the Mk 1. Your build is good motivation to get working on my Mk IV. Looks great so far Matthew. Nice clean build. Which paint scheme are you going for? Im thinking about picking up either the Meng or Takom kit. Since I was off from work today I managed to finish assembling the Mark I. The correction set from MR Modellbau arrived some days ago and it felt kind of "old school" working with resin again. The drivers cab/dog house from MR needed some work to fit and unfortunately it had some air bubbles on it too. 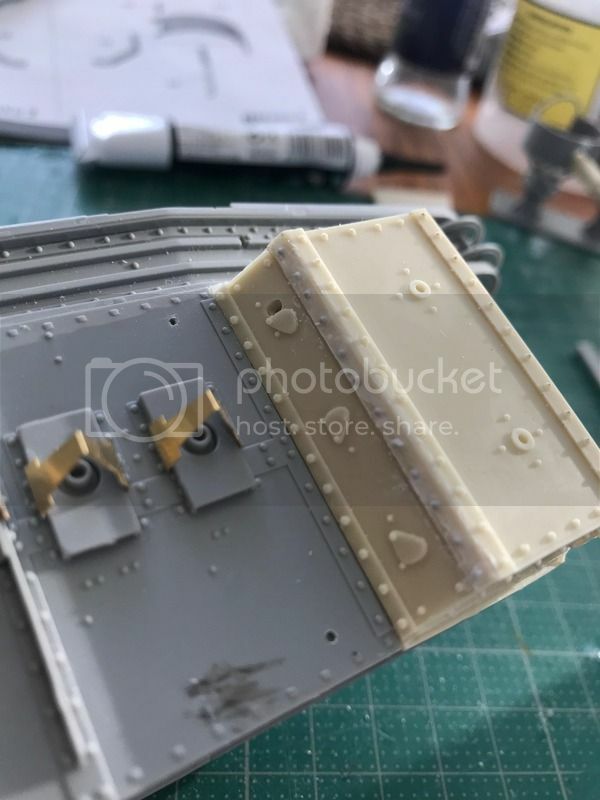 I filled in the air bubbles, sanded off all the rivets and replaced them with the spare ones that came on the Takom sprues. 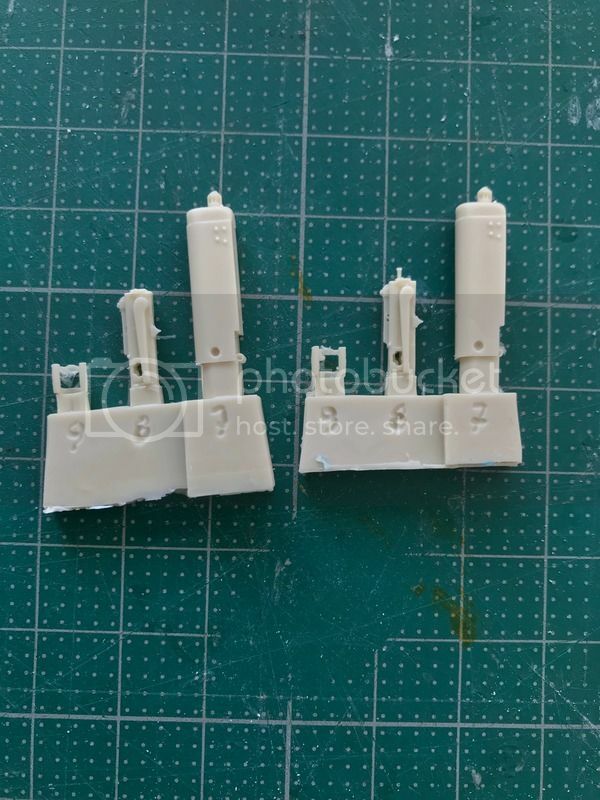 Next up I assembled the the machine gun housings and decided to use the machine guns that came in the MR kit. They're quite nice and I think they're a slight improvement over the ones in the kit. 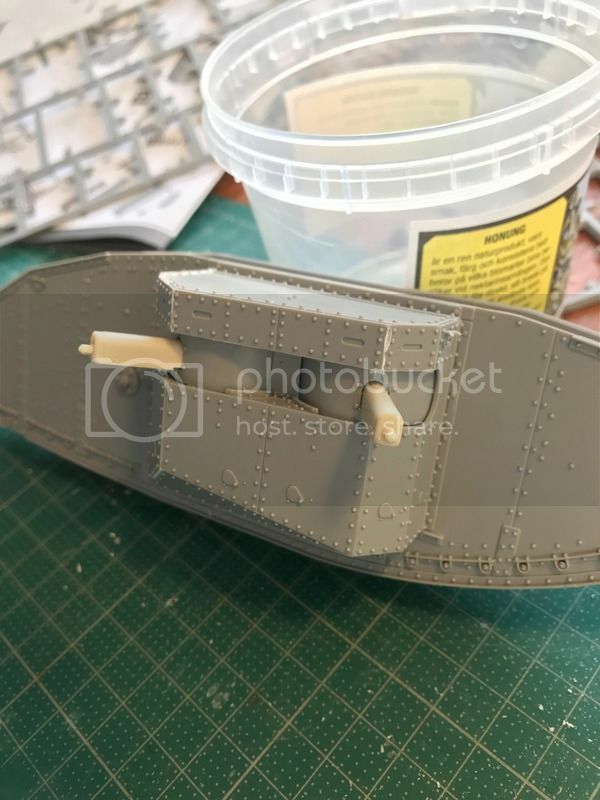 It was quite a fiddling task to put together the two housings for the machine guns and some filler and patience was needed. This is where I am now. 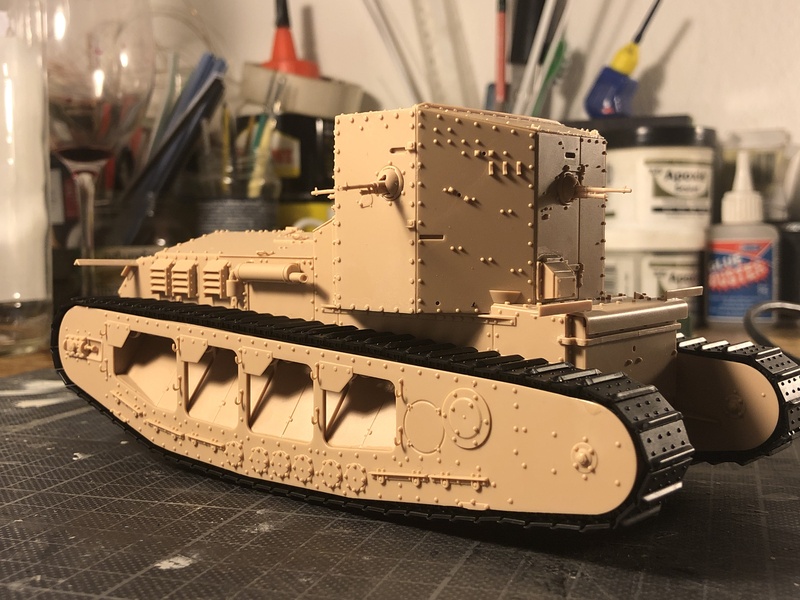 All in all this was a really enjoyable and fast kit to build (besides all the small wheels that won't be shown once the tracks are on). Now on to the fun part, painting it! Henrik - with the P/E the resin enhances the build. I like that one of the pistol ports was open and the rest closed. A neat & convincing detail. 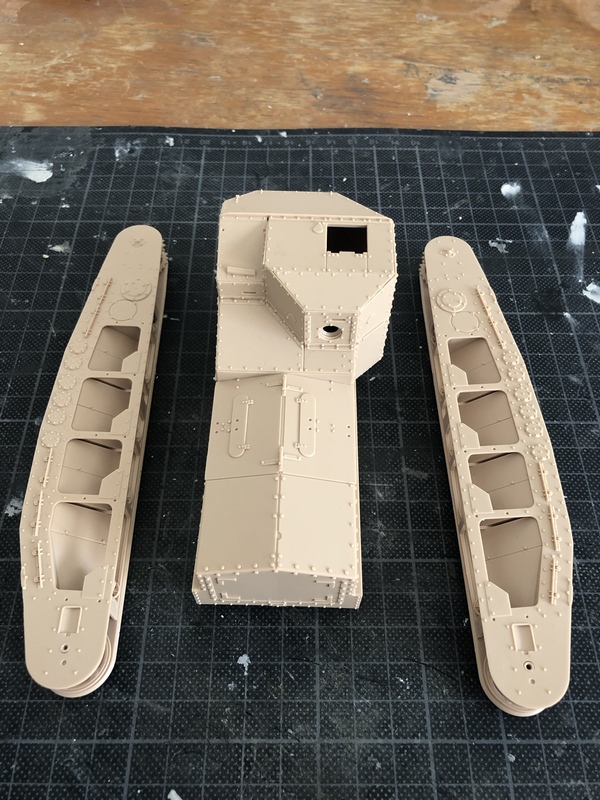 I have an Su-9 Fishpot build nearing completion for a campaign over on AeroScale and then I can dig in to the Mk. IV. Its sitting right on my work bench winking at me . 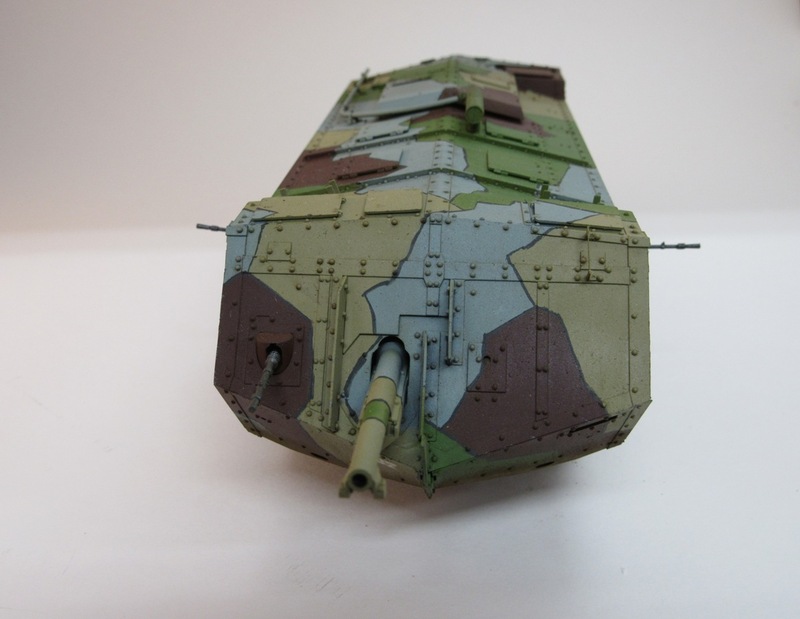 . .
With the Fishpot paint drying it was time to start the Tamiya Mk IV. 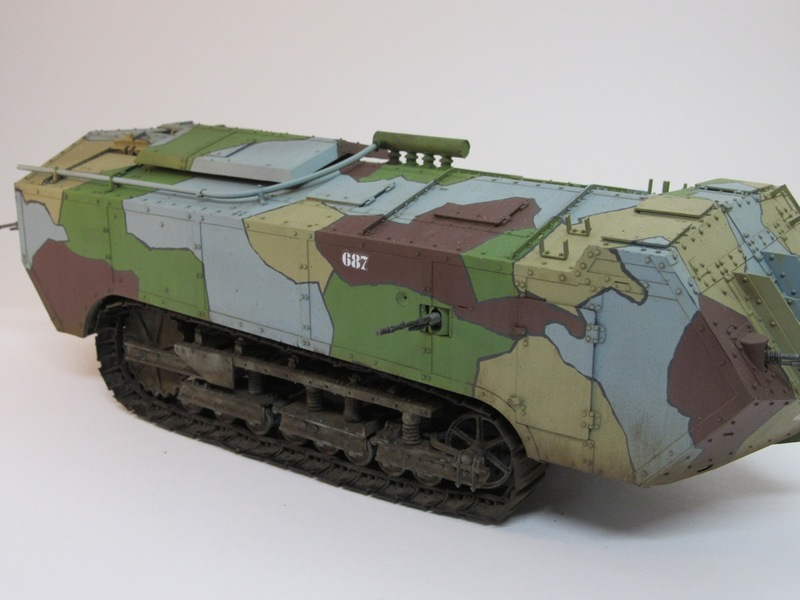 I love starting a new kit and this one in particular as I have long wanted to build one of these early tanks. This kit was a joy from the first step. The plastic is easy to work, strong & the moldings are clean and needed very little work to prepare them for assembly. 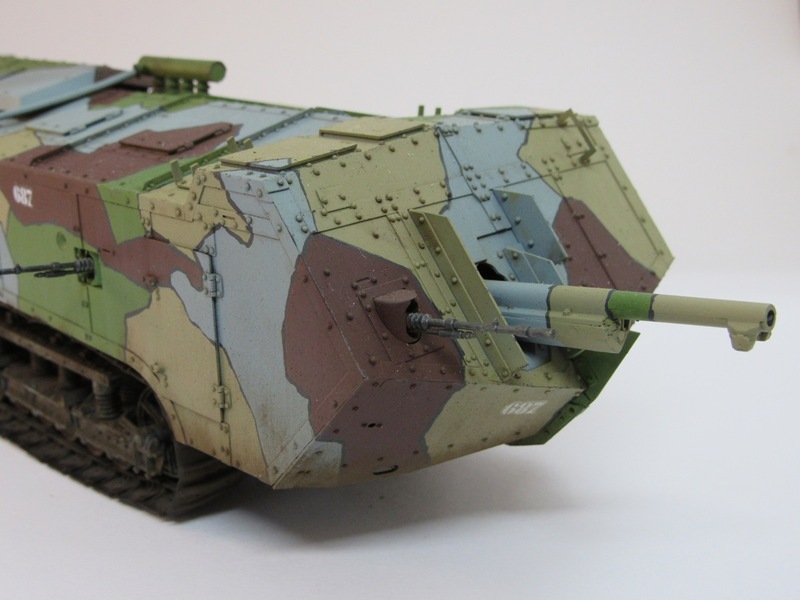 I have built Tamiya kits in the past and some were nice some were not. This one has, so far, just about snicked together. The fit has been perfect! The instructions are good with some muddled issues. Tamiya has the plastic down but could learn something from WingNutWings in completeness & clarity. 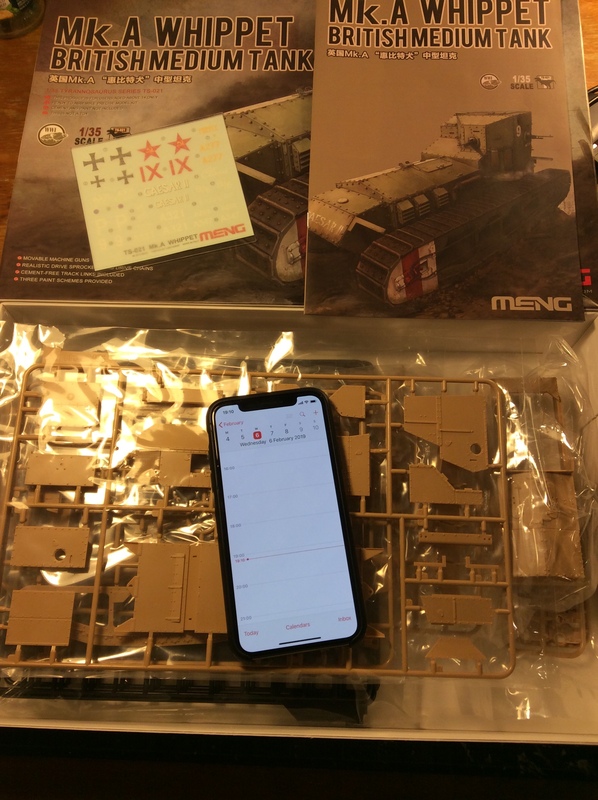 This kit is motorized and I have some concerns that liberties have been taken with scale to add this toy-like feature. So far, the motorization has been easy & fun to build. If there are distortions, I haven't seen them yet. A bowl full of wheels, there is an evening's work here. Some are two part, others four part. The bits fit well and needed only minor cleanup. There are a lot of them! 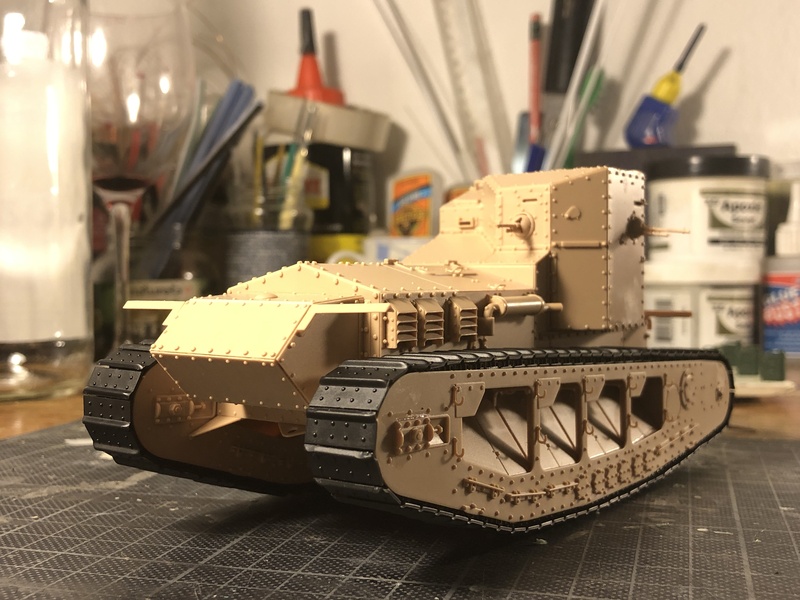 More progress on the Tamiya Mk. IV. 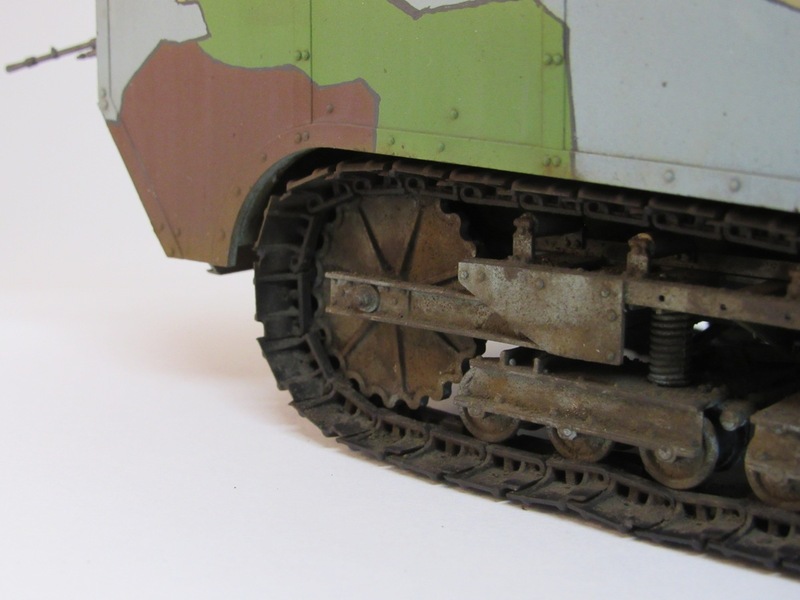 The drive gears were assembled without issue and all the little road wheels were fitted to the chassis. Tamiya supplies a clear gel grease with the kit and it was used to get everything moving easily. As before, everything fit perfectly and went together without issue. I probably should back off of that last statement a bit, one of the screws holding the drive gear retainer stripped its plastic hole. I just coated the screw with gel CA glue and reinstalled it. All seems solid and with a battery installed works as it should. 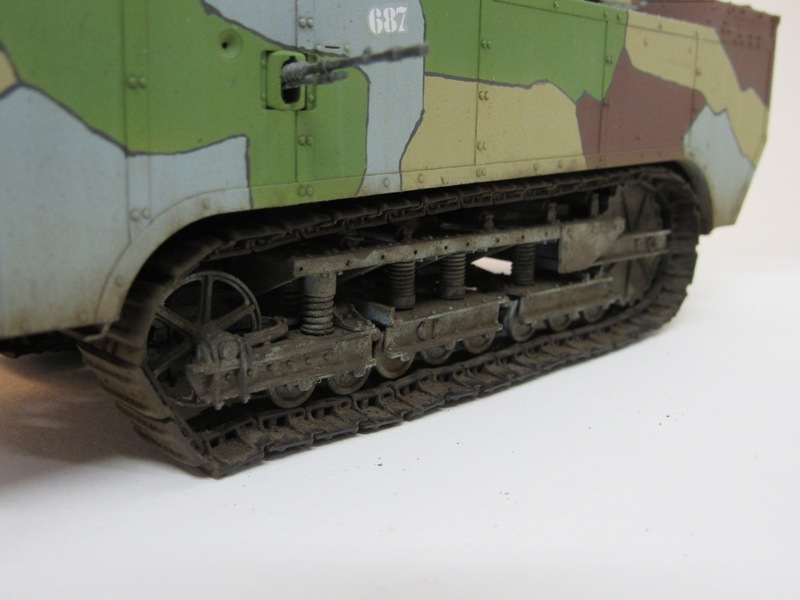 I trial fitted the idler wheels & drive sprockets to see how much would be visable once the tracks were installed. They will come back off for painting later. I then started to assemble a few links of the tracks to try on the wheels and found that they snapped together so well and so quickly that after an hour or so both links were done and ready for paint. Someone finally did tracks right! The tracks were trial fitted and the wheels are completely hidden, no reason to bother painting wheels & sprockets.